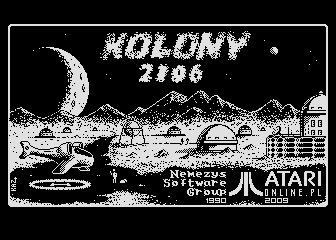 I'm glad I can release next new Atari game called "Kolony 2106". There are two version, one is available as boxed for collectors in price of 15 euro (20 US dollars), the second is set of files for free. Please remember to choose version you prefere (3 SDDD discs or 1 DDDD disc). Urborg can also provide shipping price for your country. Europe - around 3,5 euro. Edited by Kaz atarionline.pl, Tue Oct 27, 2009 6:56 AM. Whoa! Can't wait to get mine!! I've just downloaded the game and had a quick look through over the last few minutes. I need to build up my knowledge of the game, it is definitely a RTFM game. 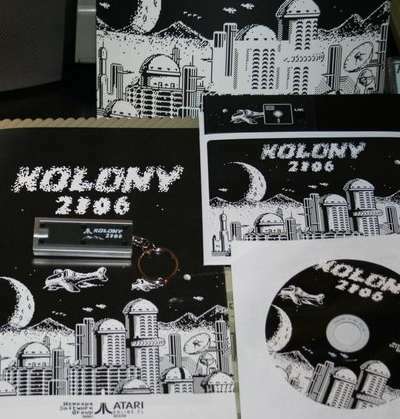 From what I've seen so far, it looks very well presented and a massively worthy addition to the Atari 8 bit catalogue. Thank you for releasing such a game, and also for releasing it in several languages. I've seen so many games that look like they're really good but they're only in Polish and so I cannot appreciate them.... (though have to be very pleased at how many games are in English and sometimes German which I can also speak - sort of). What does RTFM acronym stand for? it originally was "read the FURNISHED (included) manual"
Hi Kaz, I noticed that the English text in the video of the game is your early draft version before the edits were made. Were the edits to the text not included in the end? Edited by Tezz, Thu Oct 29, 2009 8:14 AM. Will find out, maybe I run the older version. BTW: one free copy for you, thanks for help with translation! PS. Moreover, we have free copy for Gauntman. Gauntman, do you hear me? Can we send your copy to Zaxon too? In the english version sometimes text from screens is not 'erased' when a window is closed. So when changing windows old text stays on the screen, which looks terrible. This is not a bug, program should work that way. We decide to not erase old window when user open a new one but leave it and draw new window above it. Version where windows were erased each time worked a bit slower, and process of erasing the window was a bit annoying. We think that people are used to having many windows open on their PCs so drawing new windows over old ones is a better solution. Edited by urborg, Sun Nov 1, 2009 8:02 AM. Hi, I like this game, but is it possible to get the 500 million? I ask this because I am finding that I have to spend a long time selling stuff. So long that the palette-swapping screensaver kicks in and won't switch off until I leave the menu! I put the emulator up to maximum (1800%) but it still takes a long time to sell off thousands of goods. Is there a key to speed up the buying and selling of lots of items? 500 milions and even more is possible . There is of course simple way to make numbers skip faster. Pull joystick left or right to sell or buy goods, and when joystick is pulled press fire to speed it up. This feature is implemented in most of the game windows where there is need to set up some values. Btw same way it works when you are using keybord instead joystick to control the game. Just hold arrow key and then press Shift. 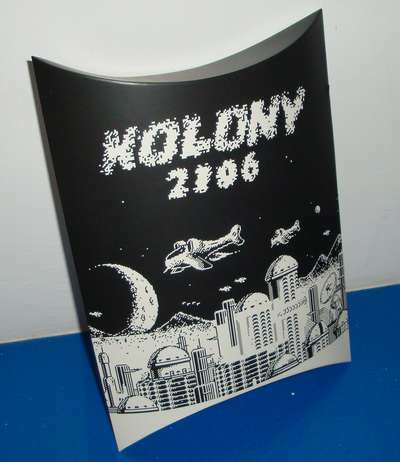 Kolony 2106 arrived in Switzerland. Very good package and nice price. The box's shape is original but it's not easy to range in the bookcase! Edited by Philsan, Tue Nov 24, 2009 4:34 AM. Really looking forward to receiving mine. I've been playing on the emulator today and it is annoyingly addictive Congrats on a fine game to all involved. I'd like to try this out, but something strange happens when I download it! My Mac (OS10.4.11) wants to append the .txt designation after the .atr and I cannot for the life of me prohibit this from happening! If I simply rename the file and chop off the .txt part - the game will not load. Can someone help me out here? Why does my Mac 'force' an .atr download to be a .txt file? I does that to me too. Try Ctrl+Click->Save Linked File As... then change the filename to something.atr. Then when it asks if you want to append .txt say no. Seems to work for me. Edited by spookt, Tue Nov 24, 2009 2:52 PM. Thanks for the tip. Simply hitting CTRL while trying to download it doesn't work for me, BUT... if I simply click on the link and load the entire thing into my browser and *then* go to 'save as', it gives me the option to append or not. Thanks, will have to give it a try later now! Man! How do you get to 5,000,000? Guess I need to practice.